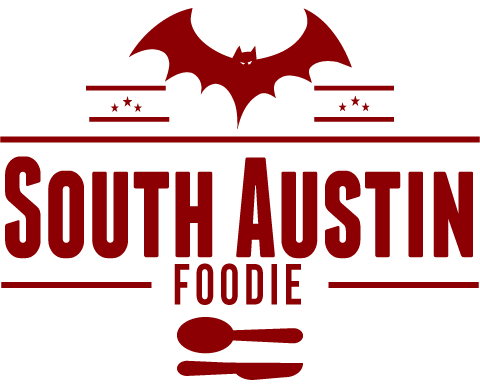 In the past couple years, South First Street from Barton Springs Road to Oltorf Street has become a bustling hubbub with various eateries and hip stores continually popping up. I've lived in the area for over 15 years, and it's nice to have so much within walking distance, especially when it comes to good food. 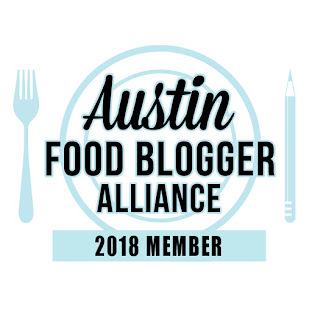 The latest addition to the Bouldin Creek food scene is the 40 North food trailer, specializing in Neapolitan-style pizza. They are directly across the street from Elizabeth Street Cafe, and share the lot with Regal Ravioli, which has always been one of my favorites. 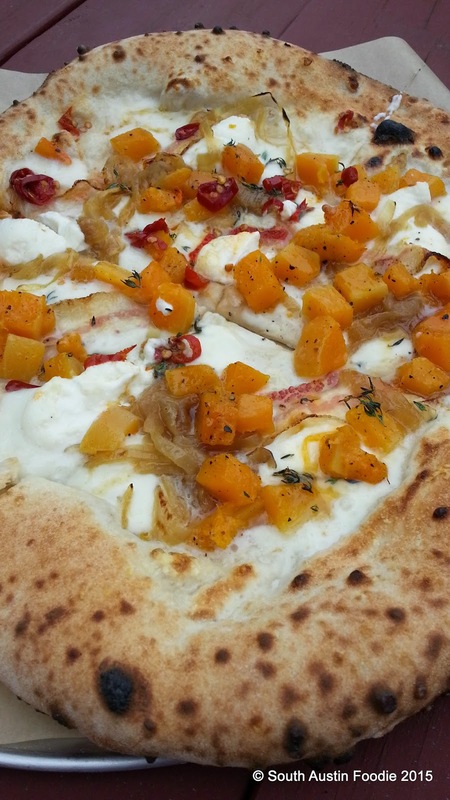 I was invited by 40 North to try their pizzas. 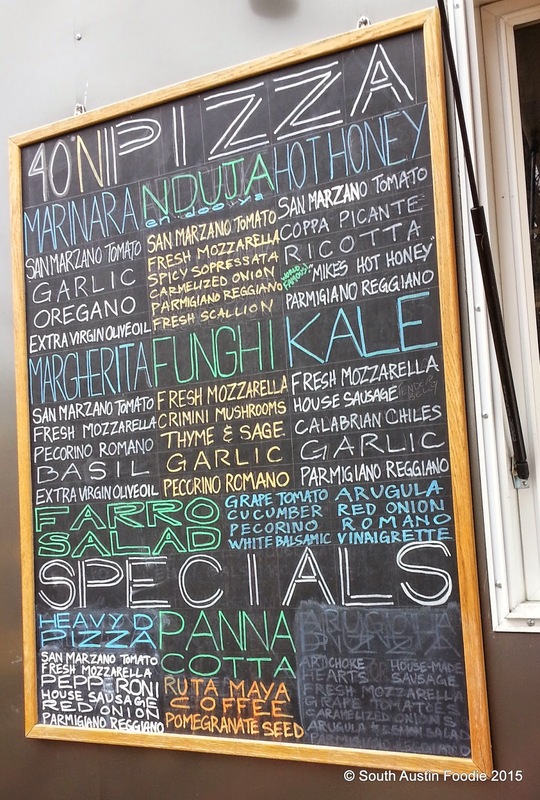 They offer six regular pizzas and then a couple rotating weekly specials, as well as some salads and dessert. Owner/chef Clint says once the weather is warmer, he hopes to expand some of the salad and other offerings. He was a lawyer in New York before deciding law wasn't his thing, and went to Italy to study the craft of pizza making in Naples (hence the name, as Naples is at the 40⁰ latitude mark), and then returned to Brooklyn and worked in a pizza shop there, before moving to Austin in 2011. He hopes for a brick and mortar spot down the road! Their trailer contains a wood-burning oven, which takes up almost half the trailer space. 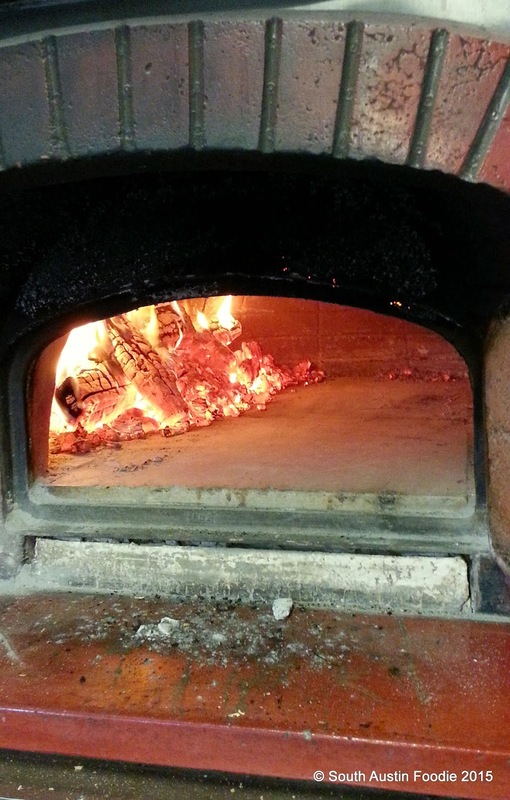 On this blustery February day, we were invited inside the trailer to check it out, and to see the oven first hand. You could immediately feel the heat! Those beautiful coals are burning at over 900⁰, and they actually had to cool it down a bit before serving pizzas; 850⁰ is more the ideal temperature, and pizzas cook in about 90 seconds. 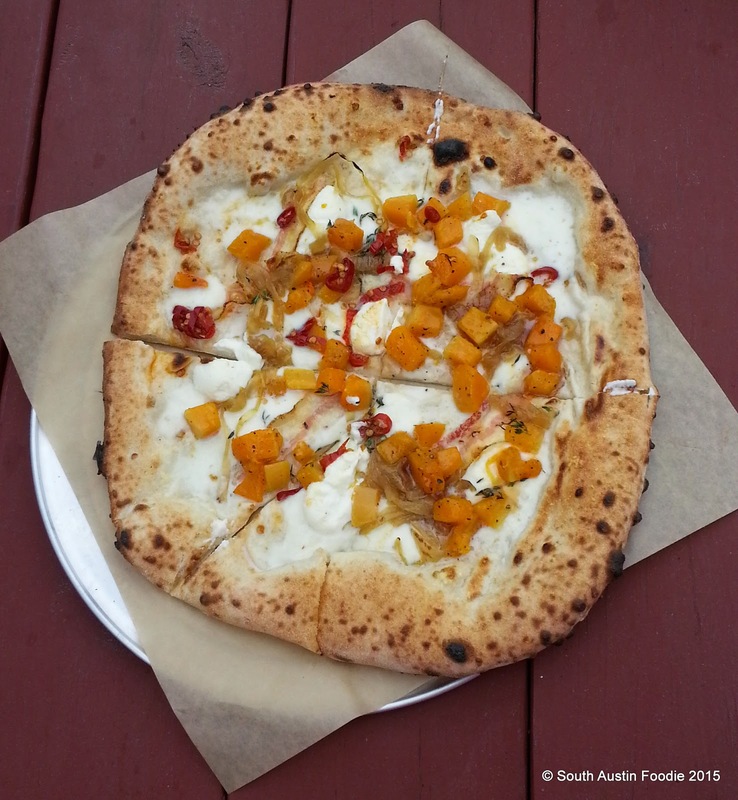 The first one we tried was one of the specials, butternut squash with caramelized onions, ricotta, a bit of thyme, calabrian peppers, and a drizzle of Mike's Hot Honey (honey infused with chiles). Loved it! I am a sucker for sweet and savory, and all the components together worked extremely well. The crust which is very lightly charred at the edges, had a very nice chew to it without being overly dense. 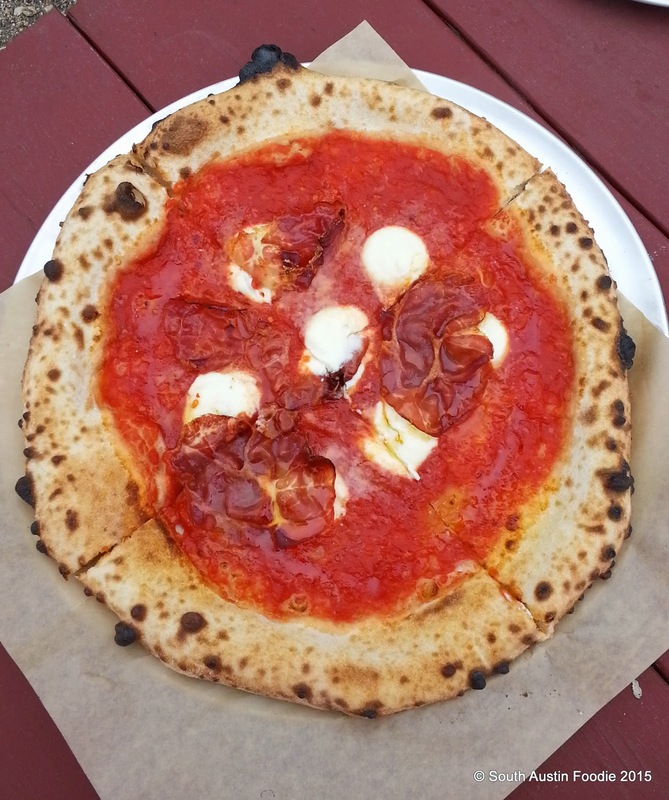 Then we tried the hot honey pizza, which is a regular menu item; with a base sauce of San Marzano tomatoes, it has hot coppa salumi, ricotta, and a drizzle of the hot honey as well. The coppa crisps up nicely, and again with the contrast of the honey, it makes for a tasty pie. Beautiful and delicious pizzas. 40 North knows what they're doing and they're doing it well. I definitely suggest you go check them out! They have live music on some Saturdays, so check out their Facebook page or website for updated info. A fabulous addition to the neighborhood! Full disclosure: I was invited by 40 North to check them out, but was not paid for my opinion or a blog post. But I am happily and honestly providing one that I hope will make you want to go try them!